Manage updates (and much more!) for your WordPress websites all in one place. Save time logging in to multiple websites to perform WordPress admin tasks. End the feast and famine cycle of freelancing by offering WordPress maintenance services. iThemes Sync can help you make steady, reliable income by helping you provide monthly WordPress maintenance services for your clients. iThemes Sync is designed to help you manage and maintain all your WordPress websites from one place to save you time and hassle. Instead of logging in to multiple websites, you have one central dashboard to perform WordPress admin tasks. View a list of available updates for WordPress core, plugins and themes and update with one click. Get a quick overview of the number of available updates, run individual updates and view plugin changelogs from the Sync dashboard. Sync Pro offers a way to monitor WordPress uptime, downtime & overall performance for all your WordPress websites. Get notification emails when sites go down and view a history of your overall WordPress performance. 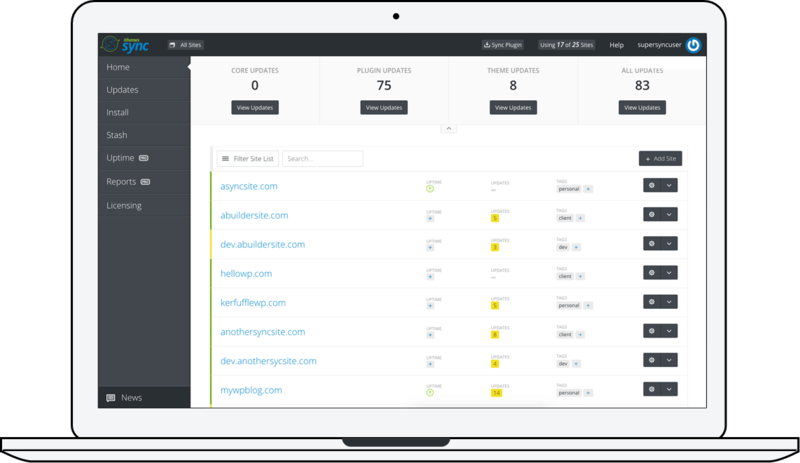 Track key SEO metrics with Sync's SEO Checker and Google Analytics & Google Search Console integration. Sync integrates with the Yoast SEO plugin to give you an overview of the health of your SEO efforts. Remotely update, activate, deactivate or delete WordPress themes and plugins. Bulk install themes and plugins across multiple sites from sources like the WordPress.org repository, zip upload and your iThemes membership. 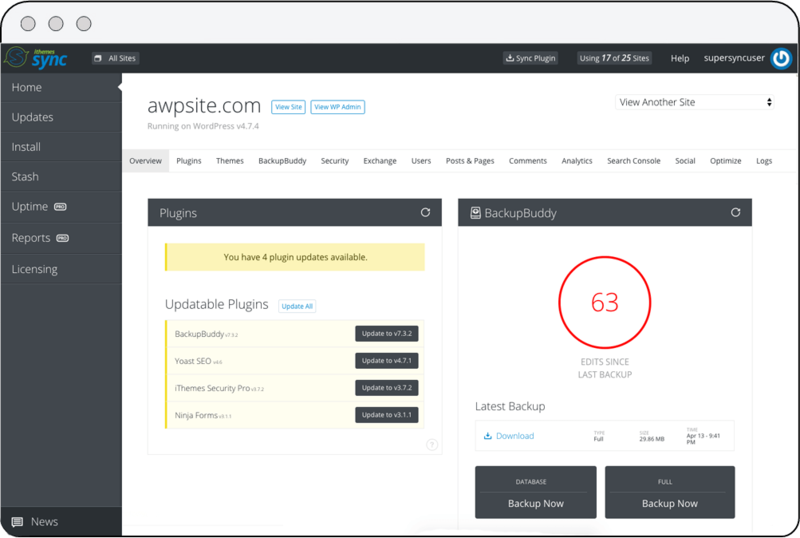 Run remote backups with Sync's integration with BackupBuddy, our WordPress backup plugin, and perform more WordPress security actions from Sync with iThemes Security, our WordPress security plugin. With Sync's Client Dashboard, you can hide WordPress menu items for certain users. Sync's Client Dashboard is essentially a WordPress role manager that customizes WordPress dashboard access. Logging in to multiple websites is tedious and time-consuming. No more keeping up with multiple usernames and passwords. With Sync, you have one dashboard for all your WordPress websites. Sync allows you to perform a host of admin tasks remotely—like installing themes and plugins, managing comments, running updates, adding users and much more. WordPress updates are important both for the security and efficiency of WordPress websites. Sync totally changes the way you update your WordPress sites—with one click, from one single dashboard. Search and install from WordPress.org, and view your WordPress.org profile favorites. Upload zip files or install directly from your iThemes membership. WordPress user management in Sync allows you view all users on a website, edit user profiles and delete users remotely. 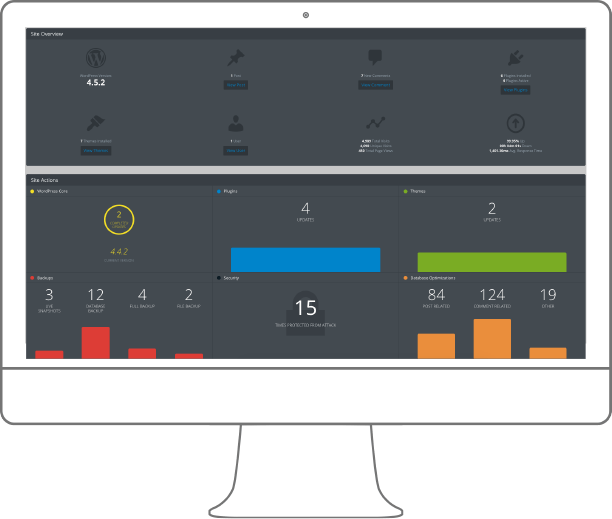 With Client Dashboard, you can customize how the user sees the WordPress dashboard. Make sure your WordPress sites are running efficiently with WordPress optimizations. Sync handles actions like cleaning out post revisions, spam comments and more. Quickly jump to the WordPress Admin dashboard of your WordPress site where you’ll be instantly logged in. You can also switch between any WordPress user account registered on the site without sharing password info. View a list of current posts and pages on your site, including the title, author, date last modified, focus keyword, SEO score and SEO readability. Duplicate posts - once clicked, takes you to a new, duplicate post on the site. View all comments (all, approved, pending, spam, trash) and unapprove, mark as spam, or move comments to trash. Sync Pro was made for anyone managing multiple WordPress sites. If you're building sites for clients, you'll love how Sync makes caring for client sites easier and more profitable. With Sync Pro, you get Client Dashboard, a WordPress role manager that controls which menu items your clients see in their WordPress dashboard. Don't want them have access to plugins, themes or settings? Simplify their dashboard so they only see what they need -- like posts and pages. To keep your clients or other site users from messing with your Sync authentication or removing the plugin, you can choose to hide or show the plugin in the WordPress dashboard of each site you manage with Sync. If you have other people on your team that you'd like to task with helping you maintain sites, this feature is a great way help you easily delegate your workload to other team members. Sync’s Notes feature is a handy way to keep notations about your Synced sites. For example, if you added customizations to theme or plugin files that could be lost with an update, add a reminder. Tag business sites, personal sites, client sites, live, non-live or however you want to be able identify your sites. Add an extra layer of protection to your Sync dashboard login with two-factor authentication. Once enabled, Sync will require both a password AND an SMS code sent to your mobile device to log in to the Sync Dashboard. Monitor WordPress uptime and know immediately if one of your websites goes down with uptime notification emails. View uptime stats such as total uptime percentage, total downtime, and number of downtimes for WordPress performance monitoring. Temporarily whitelist your IP Address remotely so you don't get locked out of your website by the iThemes Security plugin's Bad Users feature. View and release any current iThemes Security lockouts. Get a daily summary of available WordPress updates as a helpful reminder to log in and run updates. Customize the delivery time your daily notification emails to fit your schedule. View a summary of all available updates for all your websites and then update them all with one click. View update logs that include all updates made in Sync, including the date of the update, previous version number and new version number. The in-depth individual site view gives you a detailed view of the available updates for that site, with more WordPress site management action options. View a listing of individual theme and plugins you have installed on your websites along with available update information. If you've made customizations to your themes and plugins, an update could overwrite your work. Choose to ignore updates for specific themes and plugins. Search and install themes and plugins from WordPress.org remotely from Sync. View your WordPress.org profile favorites to save time. Run remote WordPress backups, download your latest backup file, view number of edits since your last BackupBuddy backup and download ImportBuddy remotely. View, download and delete your BackupBuddy Stash backups, and view a graph of the total amount of Stash space you've used. Temporarily Whitelist your IP Address remotely so you don't get locked out of the website. View and release any iThemes Security lockouts. License iThemes plugins and themes on any of your Sync sites, and easily remove licenses. View a list of recent transactions, order number, status, total order amount. View stats on sales today, sales this month, transactions today, transactions this month. Track Google Analytics for multiple WordPress sites. View key metrics from Google Analytics such as traffic, landing pages, keywords, sessions and referrer URLS. Get a quick summary of Google Search Console data, view search analytics, crawl errors and sitemaps info. Automatically share posts and pages to Twitter. Once activated, adds a button to your WordPress post editor to tweet. Sync's SEO Checker feature integrates with the Yoast SEO Plugin so you can quickly see the SEO status of the content on your WordPress website. From Sync, you can view all the forms you’ve created in Gravity Forms for that site. You can also quickly see how many responses and views each form has received. Easily add a complete series of WordPress onboarding tutorial videos to the WordPress dashboard of your client sites with Sync's WP101 plugin integration. Sync's individual site view allows you to perform site-specific admin actions such as running WordPress plugin and theme updates, making remote WordPress backups and more. Detailed website reports are one of the best ways to show clients the value of a monthly WordPress maintenance plan. Sync Pro's WordPress Maintenance Reports handle the hard work of compiling all the update actions you took, so you can justify the value of what you do. Upload your own logo and set custom colors for the header, footer and button color of report emails to better match your company’s branding. Reports include all update actions taken within a certain timeframe, both from the Sync dashboard and the WordPress dashboard. See a full list of all of stats included in Sync's WordPress reports. Reports are delivered as beautiful, interactive HTML reports so clients can get a visual summary of the WordPress maintenance you provide. Sync handles compiling and organizing update actions and key website stats. See a WordPress maintenance report demo. Summarize key SEO Stats stats in an easy-to-digest format — showing how your client’s sites are doing in Google and where they can improve. See a WordPress SEO report demo. Note: Sync plans can be combined. If you have the 10-site plan and upgrade to the 25-site plan, you can manage up to 35 total sites. If you have questions about upgrading your Sync plan or need more than 100 sites, contact us here. Install the iThemes Sync plugin on your site, then log in to your iThemes Sync Dashboard. From there, you can see the available updates for each site and update to the latest version of WordPress or any installed themes and plugins remotely. Right now Sync can update your WordPress version, themes and plugins. You can also now activate and deactivate plugins and themes, and manage BackupBuddy backups all from Sync. And there’s more cool stuff on the way. Check out our public roadmap. Is Sync considered a plugin? We don’t consider Sync a plugin, but a central dashboard. Sync does require a plugin to work, but we handle the installation and activation for you. If you prefer to install the Sync plugin manually, you can download the plugin directly from the Sync dashboard after you log in. Here’s more information on getting started with Sync. How many sites can I add in Sync? You can use Sync on up to 100 sites, depending on which plan you have. Active iThemes customers can sync up to 10 sites per customer account for free. You can check out the upgrade options to manage more sites (up to 100 for now). Do you have tutorials and documentation for Sync? Yes. Check out these Sync video tutorials and the iThemes Codex for Sync documentation for more detailed information about Sync features. Will Sync work with all my themes and plugins? All themes and plugins that have automatic updates available can be updated from Sync. For iThemes products and other commercial products, you need to be sure to license or register them first so you can update those. Do I have to be an iThemes customer to use Sync? Not anymore.  At first, we introduced iThemes Sync just to our community. But now anyone can sign up for a Sync plan. Can I combine (stack) Sync site plans? Yes, Sync plans can be combined. For example, if you have the 10-site plan and upgrade to the 25-site plan, you can manage up to 35 total sites. If you have questions about Sync plans or need more than 100 sites, contact us here. Can I have a Sync Standard plan and Sync Pro plan on one account? No, you can only have either a Sync Standard plan or Sync Pro plan on one account. Because of the way Sync works, we can’t support both types of plans on one account. If you have any questions about your Sync account, you can contact us here. Will this work in my local environment? No. You need an Internet connection to the site and thus to the updates in order for Sync to work. Yes. Sync uses industry standard SSL technology to encrypt your site details and only allows access from the accounts you authenticate. the Sync authentication or removing the plugin? You can choose to hide or show the Sync plugin from being visible in the site’s WordPress dashboard. This way, your clients or anyone else using the site can’t see iThemes Sync to remove or deactivate it. it count against my total number of available Sync sites? Yes. Sync includes the option to add additional Sync users to a site, but adding that user will count against their total number of available Sync sites. Any site managed from the Sync dashboard, even if you’ve been added as a user by someone else, is still a site you’re managing with Sync, so it counts against your total number of available sites. Can I purchase additional Sync sites to go with my Toolkit? Sync and Sync Pro plans can’t be combined, so if you wish to purchase additional Sync sites beyond what’s included in your Toolkit, please contact our sales team. What’s coming next for Sync? We have big plans for the future of iThemes Sync. Check out our public roadmap for more details and to vote on future features you want to see. To add a feature request, use this form to tell us what you want to see Sync help you do in the future.